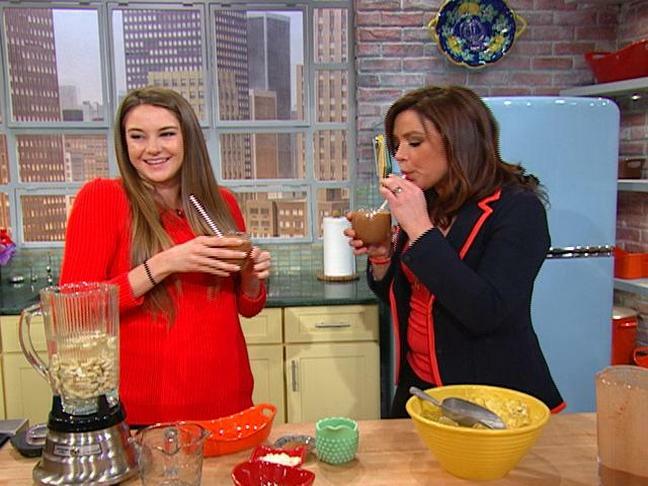 'The Secret Life of the American Teenager' star Shailene Woodley stopped by the Rachael Ray Show to chat about foraging for her own food, and going barefoot on the red carpet. Tune in this morning to see Shailene's full interview about her approach to eating and dealing with her rising fame in Hollywood after the success of her role in 'The Descendants', co-starring George Clooney. Here's a sneak peek – plus Shailene's recipe for Iced Hot Chocolate Smoothie! "Like I live in Los Angeles and I'll go an hour away into the mountains and I'll find stinging nettle and mugwart and a bunch of other herbs that you can use medicinally. Stinging nettle is so tasty, it's like spinach, it's so good for you too! It's very nutritional." I have so many awkward moments because it's such a weird concept to me, getting dressed up and going to events. It's so bizarre, right? "I don't like shoes ever and so on the red carpet, when I'm done with photos, I'll take my shoes off and do the rest of the red carpet, where you're doing face-to-face interviews where they don't see your whole body, barefoot. I think it made a lot of people feel very awkward." Blend cashews and coconut water until creamy, 20-30 seconds. Add remaining ingredients and blend well until smooth and creamy, about 45 seconds. Reese Witherspoon Is Expecting Baby #3Hilary Duff And Mike Comrie Welcome A Son!